Practically everybody has heard of carbohydrates and generally associate them with gaining weight. As a result, a type of negative view is held or the notion of restricting carbohydrate intake. That could cause problems if you go too far because your body runs on energy and other life-giving by-products from carbos. You’ve heard of glucose which is blood sugar. The sugar in milk is lactose which will be familiar if you’re lactose intolerant. And the granddaddy of them all is white table sugar, or sucrose. There are many others but these are examples most people should recognize. You may be surprised to know that carbohydrates perform many vital functions throughout all life forms and not all related to producing energy. Ribose, a sugar, is an essential part of special types of enzymes called coenzymes. This same sugar is found in RNA which is a special molecule important to genetics. No doubt you’ve heard of DNA, and it does not use ribose but a relative called, deoxyribose. Plants use cellulose in their structure as well as certain classes of insects. Those are a few example out of hundreds of critical uses and functions of carbohydrates that life depends on. Carbohydrates are further classed as simple or complex. 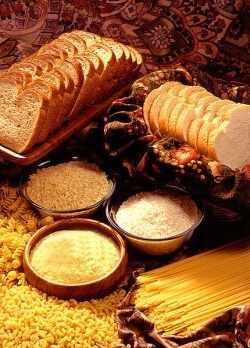 Grains used in breads, pasta, and cereals contain complex carbohydrates. Sweet foods and snacks will contain sugars as an ingredient and these are simple carbos. Fiber is important to help keep your digestive tract clear and free of unhealthy waste build-up. You learned about cellulose and how it’s used by plants and insects. Humans, and most other life forms, cannot digest cellulose or similarly complex forms of sugars. But, these food types are sources of dietary fiber you need to eat every day. You’ll see variations for the recommended amount of carbohydrates you should eat each day. But you have to make the distinction between complex and simple carbohydrates. Most of your daily carbs, anywhere from roughly 40% to 70%, should be complex and try to keep simple sugar intake down to about 10%. These are guidelines and the important point is to eat more complex carbs along with plenty of fiber.